What's Going On in St. Kitts and Nevis? Wondering what St Kitts Nevis events will be going on while you are here? The calendar of events for St. Kitts Nevis features a blend of cultural, sporting, heritage and other events that take place throughout the year, at the national as well as the community level. Although I'm sure you would like to hear more about all the events, it will not be possible for me to highlight all of them on this page. Instead, I will focus on the major happenings on the St Kitts Nevis events calendar. Carnival in St Kitts is celebrated from about the middle of December to early January and features street jamming, carnival shows, parades of troupes, bands and folklore. A major highlight of St Kitts carnival is 'J'ouvert Morning', where revellers party and dance in the streets to the pulsating sounds of the steel bands, brass bands and hi-fi sets. The jamming starts from dawn on December 26 until the last band stops playing. Since carnival in St Kitts takes place during the Christmas season, there is a double reason to celebrate. This time of the year is by far the most festive time on the island. 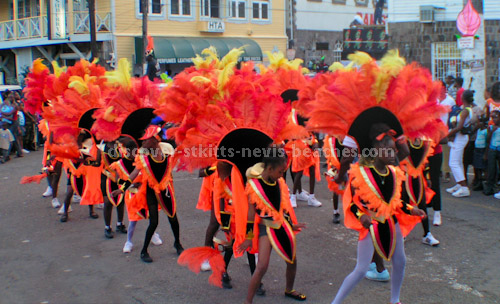 This St Kitts Nevis event which is held in May, is the main athletic event that is held in St. Kitts. Over the years it has attracted a large number of local, regional and international competitors, some from as far away as Australia. The course includes a swim in the calm waters of the Caribbean Sea at South Frigate Bay, a challenging ride along the scenic Southeast Peninsula, and a run along in the Frigate Bay area. The St Kitts triathlon was once designated as an ITU sanctioned event that allows elite competitors to earn points towards world rankings. The St Kitts Music Festival was launched in 1996, and since then the annual St. Kitts Music Festival has usually been held over the last weekend in June. 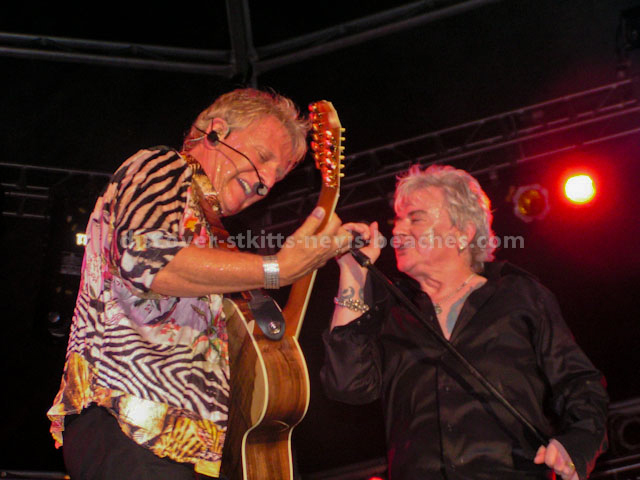 Unlike other festivals held in the Caribbean, the St. Kitts Music Festival is a creative blend of musical genres. This feature of the St. Kitts Music Festival has contributed to it becoming one of the Caribbean's most popular music festivals. 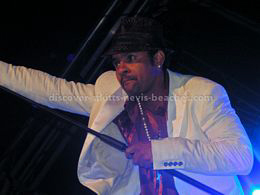 In the past, the festival has featured an interesting line-up of international, regional and local artistes including Arturo Tappin, Tabou Combo, Inner Circle, Maxine Nightingale, Latin Legends, Freddie Jackson, Cece Winans, Mighty Clouds of Joy, Krosfyah out of Barbados, Trinidad and Tobago's Roy Cape Band featuring Nigel Lewis, Kenny Rogers, Brian Mc Knight, Jagged Edge, Bunji Garlin, Destra Garcia, Square One out of Barbados, Earl Klugh, Kool & The Gang, Burning Flames, Hugh Masekela, Chaka Khan, Peabo Bryson, Culture, Shirley Caesar, David Rudder, Mighty Sparrow, Arrow out of Montserrat, Bobby Caldwell, Ashanti, Beres Hammond, DMX, Nestor Torres, Burning Spear, Maxi Priest, Sean Paul and Vegas, Chante Moore, K-CI and Jojo, Yolanda Adams, Glen Washington and Deanna Wattley. The venue for the festival in its early years was the historic Fort Thomas Hotel. Presently the festival is held at Warner Park in Basseterre. Culturama is Nevis' summer festival. 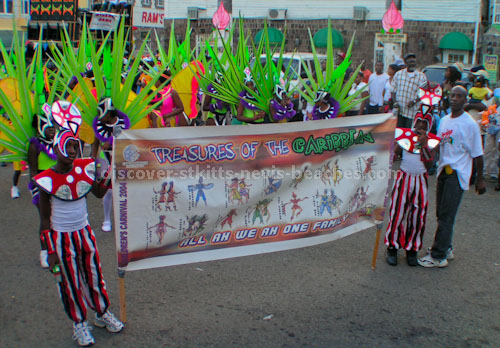 Culturama festivities get started during the later part of July and climax on the Tuesday after the Emancipation weekend. Street jamming, j'ouvert, cultural shows, calypso competitions, horse racing, and parades of troupes and bands all form part of Nevis Culturama.